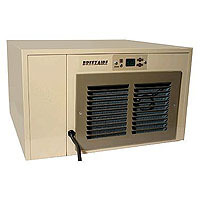 The BREEZAIRE WKC/WKCE Series cooling units are a compact design with cold air discharge on the bottom, which makes them ideal to be installed in cabinets. Because of their configuration the WKC/WKCE series cooling units are not rated for specified number of cubic feet. Comments: Fast Shipping, Good Sales support. The unit installed in my 360 bottle cabinet in less than 45 min. Replaced a 16 year old unit. Upgraded to the WKCE 2200 from the old 1060. Highly recommend the Bottle Probe, seems to keep the cycling more constant and I am in a very warm climate. I appreciate the Beverage Factory service and the Breezair quality. Comments: I installed the Breezaire into my wine cooler. The original unit lasted 20 years. The old unit slid right out and the new one right back in. Easy to order, good sales and tech support.